Please keep in mind this is an experimental framework that has been thoroughly tested by one person. Or check out the screencast to see unitizer in action. Are you tired of the deparse/dput then copy-paste R objects into test file dance, or do you use testthat::expect_equal_to_reference a lot? With unitizer you review function output at an interactive prompt as you would with informal tests. You then store the value, conditions (e.g. warnings, etc. ), and environment for use as the reference values in formal tests, all with a single keystroke. Do you wish the nature of a test failure was more immediately obvious? Do you wish that you could start debugging your failed tests without additional set-up work? Do you avoid improvements to your functions because that would require painstakingly updating many tests? The diffs for the failed tests let you immediately confirm only what you intended changed. Then you can update each test with a single keystroke. 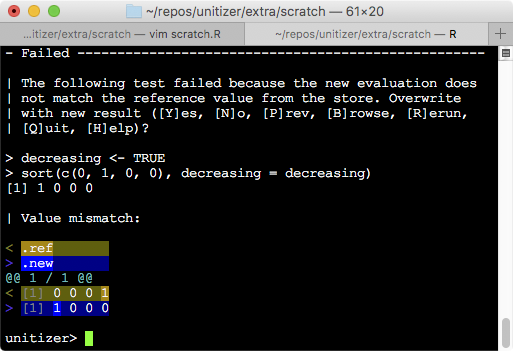 unitizer stores R expressions and the result of evaluating them so that it can detect code regressions. This is akin to saving test output to a .Rout.save file as documented in Writing R Extensions, except that we're storing the actual R objects and it is much easier to review them. unitizer can run in a non-interactive mode for use with R CMD check. R Core for developing and maintaining such a wonderfully language. Hadley Wickham for testthat from which we borrow many concepts and use for internal tests, for devtools, and for his many other packages. Gábor Csárdi for crayon through which we can add a new dimension to the R experience. Yihui Xie for knitr and J.J. Allaire et al. for rmarkdown, and by extension John MacFarlane for pandoc. @kohler for gifsicle and the ffmpeg team for ffmpeg. Brodie Gaslam is a hobbyist programmer based in the US East Coast. Set RNGversion() in internal tests due to changes to R sampling mechanism. #258 Remove devtools as a suggests dependency (reported by @jimhester). #257 Ensure all slots in S4 prototypes exist in the class definition (reported by B. Ripley). Colors in test browser working again. #220 Fix vignette ordering on CRAN. #225 Inferring file locations when not in pkg top level. #237 Option to turn off diffs. #239 Document issues with deparsing doubles in tests. #242 Correctly parse newlines in prompt input. #241 q() actually works now. #231 Report parse warnings at prompt. Wrap diffObj call in try to avoid killing unitizer section when diffObj errors. Modify test_dir calls to use wrap on testthat versions greater than 0.1.2. Interim release to get changes over past year out on the master branch. Minor release, no substantive changes.